The She Leads College Conference features inspiring talks and interactive workshops to equip young women, including female-identifying and non-binary people, in years 11 and 12 with the practical skills and knowledge they need to become confident leaders. Participants also have the opportunity to connect with inspiring women who share their leadership journeys throughout the day. The She Leads College Conference was developed in response to demand from educators following the success of our She Leads Conference and the results of the 2014 YWCA She Speaks survey. This survey of 1600 young women, aged 15-30, found that while 70 per cent of participants want to be leaders in the future, they also say that negative gender-based stereotypes damage their working lives, their sense of self, their safety in relationships, and their leadership capacity. Our fourth She Leads College Conference was again held at the Ann Harding Centre, thanks to our ongoing Venue Partnership with the University of Canberra. The Conference was held on Thursday 22 March, and welcomed 80 young women from 10 ACT and Canberra-region schools in years 11 and 12. The Conference theme, Trailblazer, drove the design and outcomes of the event, with attendees being exposed to a deeper understanding of leadership that extends to the change leaders have the potential to make in their homes, schools, communities, and workplaces. Attendees left the Conference with a greater understanding of leadership, how to effect change, how to identify positive and negative situations in their homes and communities, and gained new skills and tools to manage the myriad of issues that they face each day. Attendees were also exposed to a range of post-school career options through the speed networking session, providing them with an opportunity to explore their future options, and define their interests and aspirations. Through our evaluation process, the 2018 Conference changed format slightly, with more activities for shorter duration’s, and more of the day being hosted by YWCA Canberra staff, including the Youth Engagement team, and more local and accomplished young women. The program included local MC, Codie Bell, two keynote speeches from Hani Abdile and Karlie Noon, a panel featuring Hannah Gissane, Laura Piscopo, and FLTLT Esther Suh, a speed networking session including Engy Salah, Tahlia-Rose Vanissum, Ashleigh Streeter, Lavanya Kala, Ashley St George, Tomasina Purcell, Joanna Richards, and Elizabeth Bowler, and two workshops: Making Positive Change hosted by YWCA Canberra Youth Engagement team members, Annie-Lea Rowley and Aoife Herrick, and Leading Together to Achieve as One hosted by Defence Force Recruiting team members FLTLT Esther Suh and PO Alee-Marie Scarfone. Firstly, to believe in myself and be an active bystander! Secondly, to remember this quote – “the standard you walk past is the standard you accept”. I should push myself to my full capabilities – I CAN be a leader. Follow what I enjoy. There is no one path to success. If you are meant to do something, you will. Support other trailblazers and in turn, they will support you. State your opinion with confidence with respect to other’s opinions. Be unapologetically you! It is so important, as women, to not only lead and break the stereotype, but also help our sisters to lead too. Don’t be afraid to blaze a new trail or follow a trailblazer. My favourite part of the day is learning and seeing people that are open and vocal about the rights that everyone deserves. Favourite was seeing how successful these young speakers are, and least favourite was hurting my voice cheering in a workshop. The third annual She Leads College Conference was held at the University of Canberra on Tuesday 21 March 2017. 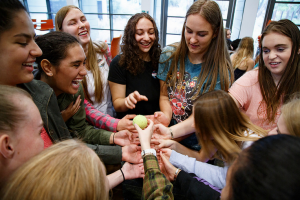 High schools and colleges from across the ACT and Queanbeyan were represented by more than 80 young women in years 11 and 12. 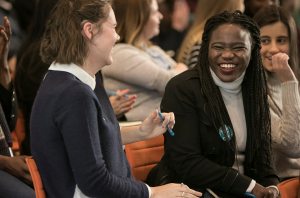 The event was designed to provide a safe space for girls in year 11 and 12 to be inspired by young women leaders and gain the confidence, knowledge and practical skills to kick-start their leadership journeys. more confidence to be a leader. Building on the success of the 2016 program, our program for 2017 included plenary sessions (including keynote presentation), two workshops, and an afternoon networking session. The Conference was emceed by yLead’s Bel Yorston, was opened by Madalein Tier, and included a keynote presentation by Sarah Moran. The networking session included eight young inspiring women from a range of sectors that discussed their leadership journey with attendees, and included Sarah Moran, Alice Workman, Alex Schumann-Gillet, Ciara Duggan, Codie Bell, Elise Pirotta, Sally Moylan, Cathy Pecotz, and Esther Suh. Workshops were facilitated by Bel Yorston and Esther Suh, and focused on leadership, confidence, and communication skills. 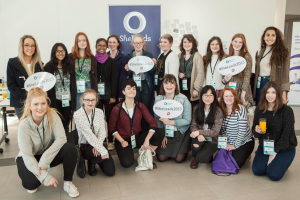 Feedback about the Conference was overwhelmingly positive, with 98 per cent strongly agreeing or agreeing that they would recommend the Conference to other young women, and 98 per cent of respondents rating the College Conference as excellent or good. I feel a bit more motivated to make a difference following today. Advice/possible pathways – having some greater direction on ways in which I could be more effective. Taking the opportunity/ the initiative highly essential. Say NO TO FEARS! That mistakes are normal and natural. It is a way to improve and strengthen your weaknesses next time you partake in a challenging situation. There are opportunities everywhere and to be able to participate in this conference, the motivation and inspiration will always lead me to the path that I would love in terms of future career and goals. Take every opportunity that you can. Be open-minded and confident within yourself. Make social connections. The second annual She Leads College Conference was held at the University of Canberra on Tuesday 26 July 2016. High schools and colleges from across the ACT and Queanbeyan were represented by 81 young women in years 11 and 12. The 2016 Conference was built around dismantling the traditional definition of leadership, which is one that has seeped into our collective consciousness, and contributes in making the identity of a ‘leader’ inaccessible to many young people – especially young women. To combat this idea of traditional and inaccessible leadership, the Conference included a wealth of young women leaders to discuss their leadership journey and offer advice to the next generation of young women. The event was emceed by yLead’s Bel Yorston, opening remarks were delivered by Caitlin Sandercock, and the Keynote speaker was Amelia Telford. The networking session allowed participants the opportunity to learn the value of networking while interacting with young women from the Canberra community who are leading and creating change. The networking sessions speakers included Farz Edraki, Caitlin Figueiredo, Erica Hediger, Emma Pocock, Ange Reakes, Rachael Stevens, Annabel Szekely, and Hannah Wandel, and workshops were facilitated by Bel Yorston, Annabel Szekely, Esther Suh, Kylie McGuinness, and Kirsty Bird. Event feedback was overwhelmingly positive, with 94 per cent agreeing that as a result of attending the She Leads College Conference they now have a greater understanding of leadership, 95 per cent agreeing that the Conference provided them with practical tools that they will be able to apply, and 100 per cent rating the Conference as excellent or good overall. I’ve been encouraged to join my school leadership team. Personal sustainability is crucial. It’s okay not to know your path yet. To be an effective leader you need to love and appreciate yourself first before trying to help others do the same. Learning that I need to have confidence in myself and my skills and to use them to help me to support others. Hearing ways to manage my team – goal setting, planning, and taking time out for myself. I am capable of anything and everything I want to do. To do this I need goals, focus, help, ambition, passion, perseverance and self-acceptance. Tell yourself you’re capable – don’t undermine your talent. A degree doesn’t end in greatness – don’t be afraid to take risks. Being a leader is not about dominance, it is about listening, guiding, imparting values and inspiring. There’s nowhere you can’t get with lots of passion and determination – you are strong. Don’t let being a woman disadvantage you. Being a woman doesn’t make you inferior. The inaugural YWCA Canberra She Leads College Conference was held at the University of Canberra on Tuesday 5 May 2015. Schools and colleges from across the ACT and Queanbeyan were represented by around 100 young women in year 11 and 12. The theme for the 2015 Conference was – Discover. Connect. Ignite. 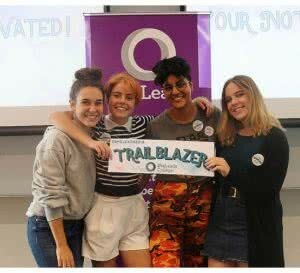 The event was designed to provide a safe space for girls in year 11 and 12 to be inspired by young women leaders, and gain the confidence, knowledge and practical skills to kick-start their leadership journeys. The overarching theme of the Conference covered topics such as leadership myths and realities – what does is really mean to be a leader?, awareness of gender stereotypes, supporting positive body image, self-confidence, unconventional leadership/career paths, and learning to deal with failure and building resilience. The Conference was emceed by Zoya Patel, and saw speakers and panellists from various industries including Carly Findlay, Sally Moylan, Ashleigh Grogan, Haylee Collins, Annabel Szekely, and Meredith. Workshops were run by Heather Dawson and independent magazine Young Vegabond, and focused on finding a leadership identity and identifying that there are many types of successful leadership styles, and engaging attendees to think critically about how constructs of gender affect their lives. Today was an inspiring day there were great stories on how women achieved becoming a leader. It inspires me in to accomplishing my goals making sure to make right choices, and controlling my life and path. This conference was so interesting and engaging. I walk away incredibly enlightened about all the different topics discussed here today. I would love to come again. That I don’t have to jump up and yell “I’m a leader” from the rooftops – sometimes leading just means being yourself. I think it helps to know that there is a big support group out there for women who want to excel in their ambitions and break down gender stereotypes. That leadership is not a position it is an action, most of all its having a positive impact and being female shouldn’t hold you back. I learnt how to become a good role model and overcome obstacles such as gender stereotypes etc. Being a leader doesn’t mean you have to be the boss. Leadership is something you define. What’s stopping me is myself. I keep doubting myself and so don’t try so hard but I need to push past that. To find out more about the next She Leads College Conference, to be held on Wednesday 20 March 2019, subscribe to our monthly She Leads Newsletter, and email sheleads@ywca-canberra.org.au.